for example a baneblade is 500ish points, a brass scorpion is 400pts, yet a brass scorpion will tear apart a baneblade. but a baneblade is 100pts more because of what it can do. its more anti personal than machine, but it can take out both. also a baneblade can kill alot more in a turn than a brass scorpion. 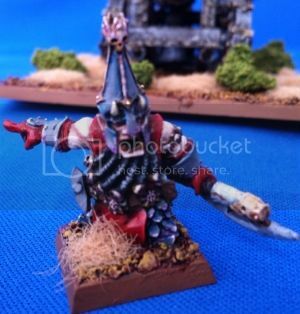 nothing is better than something else in warhammer u just need to know how to use them. I'm stating u didn't do a fair points match up. if your going to do a comparison u need to pick equal points. pts difference don't mean squat when u compare units since that gonna be used in apocalypse all i say is ambuse oh look carnifex at any board edge oh look bane blades arn't gonna move thus carnifex will eat though them. to many ways to kill both those tooled up stuff an can go either way so all down to player styles an THAT is argument over. don't start saying something can DEF kill something else unless its some thing like ap 3 against a 3+ normal save as in 40k there are MANY ways to counter an use units. even with true line of sight they couldn't see a single carnifex? ? ?, plus the harriden is a slow moving flyer so u can always trace line of sight to it. plus your opponent is an idiot if he moved tanks towards carnifexs.